Because beer is an alcoholic beverage, heavy consumption for prolonged periods can lead to health problems. When alcohol is broken down in the liver, a number of byproducts are generated that can cause liver damage. Although the liver is one of the largest organs in the body, with the ability to regenerate itself, excessive alcohol consumption can eventually lead to a number of liver conditions, including fatty liver disease, alcoholic hepatitis, cirrhosis, nonalcoholic fatty liver disease and liver cancer. Alcohol, a substance produced by the fermentation of sugars, is present in beer at a level of approximately 3 percent to 7 percent. The Centers for Disease Control and Prevention notes that 0.6 ounce of pure alcohol is considered one standard drink. This amount is found in 12 ounces of beer. According to the CDC, moderate alcohol consumption is defined as one drink per day for women and up to two drinks per day for men. Heavy drinking, for men, is defined as an average of more than two drinks per day, or more than 14 total drinks in a week. For women, heavy drinking is defined as more than one drink per day or in excess of seven drinks per week. According to Columbia Health's Go Ask Alice!, the primary condition affecting heavy drinkers is cirrhosis of the liver. Alcoholic cirrhosis is defined as the scarring of the liver. According to the American Liver Foundation, between 10 percent and 20 percent of heavy drinkers will develop cirrhosis -- an irreversible condition that can lead to liver failure. Go Ask Alice! notes that this condition, however, can be greatly influenced by genetic factors. 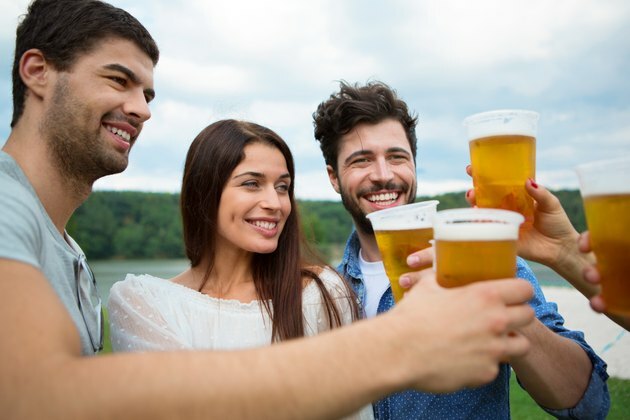 While some individuals may experience liver cirrhosis after just a few short years of consuming three or four drinks a day, others who drink heavily on a regular basis may never contract this disease. Alcohol consumption is a primary cause of liver cancer, notes the National Cancer Institute. Alcohol may contribute to cancer by its conversion to acetaldehyde, a toxic substance, by promoting DNA damage through oxidation and by inhibiting the body's ability to absorb nutrients. The institute notes that the risk of developing liver cancer is directly tied to the level of alcohol consumed. According to the American Liver Foundation, the first stage of alcoholic liver disease is fatty liver disease. This condition is defined as the accumulation of excess fat within liver cells. The foundation notes that while nearly all heavy drinkers develop fatty liver disease, this condition can be reversed once alcohol consumption is stopped. Alcoholic hepatitis, which causes swelling and damage to the liver, can result in symptoms including vomiting, loss of appetite, fever, nausea and jaundice. While mild alcoholic hepatitis can be reversed, more severe alcoholic hepatitis can lead to liver failure and death. Nonalcoholic fatty liver disease -- also characterized by the buildup of extra fat in the liver -- is not directly caused by alcohol, although individuals with liver cirrhosis and those who are overweight are more likely to develop the disease. In addition, heavy alcohol consumption can cause people to become overweight. Avoiding the health risks that come with beer consumption can largely be accomplished by limiting or monitoring your consumption. Go Ask Alice! notes that most research has concluded that consuming between one and two drinks per day for one to two days per week does not appear contribute to any health conditions. How Many Drinks Per Day Cause Cirrhosis of the Liver?